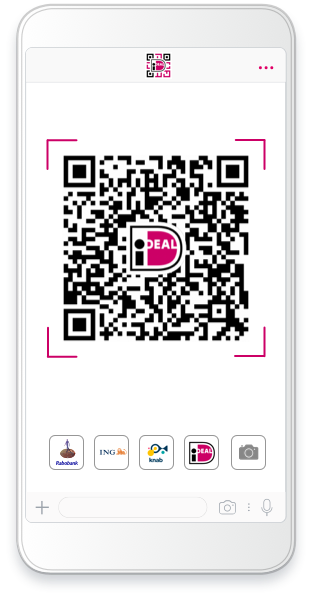 iDEAL QR makes it possible to easily make mobile payments in both a physical and online environment via the most Dutch popular payment method: iDEAL. With iDEAL QR, consumers can quickly and easily make mobile payments via a QR code. Integrate iDEAL QR into your cash register system. Do your customers want to leave a tip? No problem! iDEAL QR can be set so that the user can add tip to the amount. By printing an iDEAL QR code on your invoices, you will prevent errors arising from consumers copying the payment details. Various charities use iDEAL QR to collect donations. Think of printing iDEAL QR codes on T-shirts, posters, mailings or collection boxes. Ticketflow has used iDEAL QR during the ticket sales of festivals and for the entrance of events. For example, iDEAL QR codes were included in newspaper advertisements and banners. An iDEAL QR code can be recognized by the iDEAL logo. A payment can be initiated by scanning the QR-code with the iDEAL App or a Mobile Banking App*. In addition, CM has made it possible to "temporarily" scan iDEAL QR codes with a generic QR scanner. The customer then gives immediate approval in the trusted and safe environment of his bank. Want to experience for yourself how simple and fast iDEAL QR works? Scan the iDEAL QR-code and do a €0,01 payment. * Currently available in the Dutch mobile banking apps of Rabobank, ING and KNAB. When Carian heard about iDEAL QR it was immediately clear to us, this is the solution for our market, the restaurants, as iDEAL QR turns the client's smartphone into a mobile pin device. Together with CM, Carian developed the integration with the EasyTouchPos and introduced this in the Netherlands. IDEAL QR really adds something to our payment methods because it is the only payment method where the mobile payer really has the idea that the payment is separate from the order. What does iDEAL QR cost?